All "red" layflat hoses on the market are not the same. 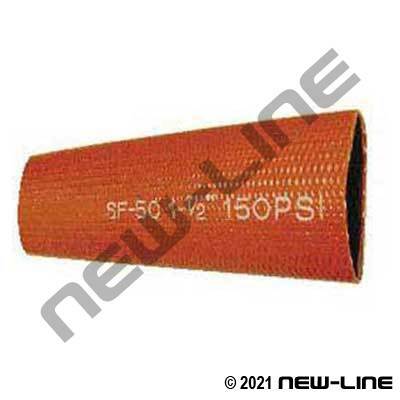 NL2420 is a 150psi PVC layflat hose (115 psi in 8" size) that is commonly used for flood protection, standby fire protection (1-1/2" size with forestry or NPSH threaded ends), irrigation and standard pump applications (NOT for use with air and not for food grade applications). It is lightweight, mildew and rot resistant. We do NOT recommend using PVC layflat style hoses for general washdown, as it will not withstand abrasion, dragging, or abuse; for washdown applications use a hose with a more abrasion resistant cover like our NL2005 , NL9770 , or NL9775 . For forestry fire assemblies, we recommend using lightweight aluminum ends rather than the lower quality 'cast brass' which are heavier and subject to warpage. Detail Comments: For other sizes please refer to our NL2425 Red Spiraflex PVC Layflat.